Mycobacterium tuberculosis is a rod-shaped, non-motile, slow-growing, acid-fast bacterium. Tuberculosis (TB) transmission occurs when a contagious patient coughs, spreading bacilli through the air. Bovine TB (caused by the closely related M. bovis) can be transmitted by consuming unpasteurized dairy products from infected cattle. Globally, 9.6 million new TB cases and 1.5 million TB-related deaths are estimated to occur each year. 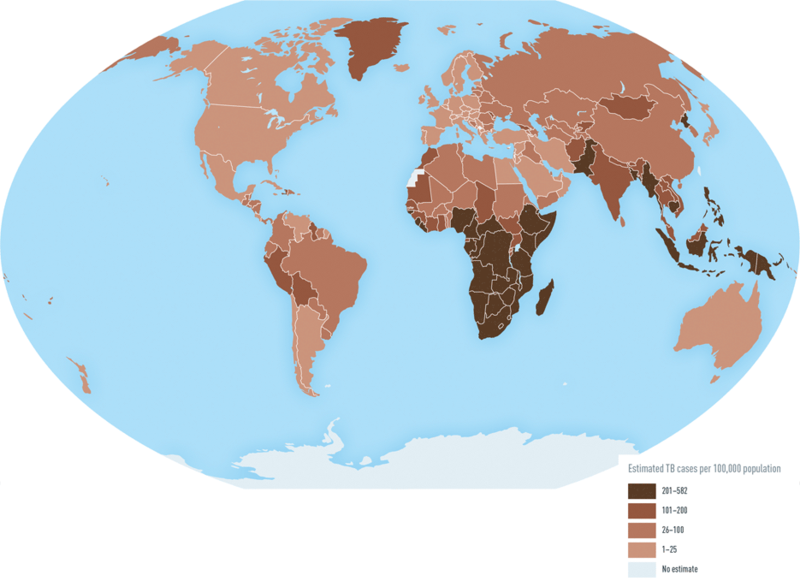 TB occurs throughout the world, but the incidence varies (see Map 3-13). In the United States, the annual incidence is 3 per 100,000 population, but in some countries in sub-Saharan Africa and Asia, the annual incidence is several hundred per 100,000. Drug-resistant TB is of increasing concern. Multidrug-resistant (MDR) TB is resistant to the 2 most effective drugs, isoniazid and rifampin. Extensively drug-resistant (XDR) TB is resistant to isoniazid and rifampin, any fluoroquinolone, and ≥1 of 3 injectable second-line drugs (amikacin, kanamycin, or capreomycin). MDR TB is less common than drug-susceptible TB, but approximately 480,000 new cases of MDR TB are diagnosed each year, and some countries have proportions of MDR TB in excess of 25% (see Table 3-20). MDR and XDR TB are of particular concern among HIV-infected or other immunocompromised people. As of 2014, XDR TB had been reported in 105 countries. Before leaving the United States, travelers who anticipate possible prolonged exposure to TB (such as those who would spend time in health care facilities, correctional facilities, or homeless shelters) or those who plan to stay for years in an endemic country should have a 2-step tuberculin skin test (TST) or a single interferon-γ release assay (IGRA), either the QuantiFERON TB test (Gold In-Tube version) or T-SPOT.TB test (see Perspectives: Tuberculin Skin Testing of Travelers, later in this chapter). If the predeparture test result is negative, a single TST or IGRA should be repeated 8–10 weeks after returning from travel. Because people with HIV infection or other immunocompromising conditions are more likely to have an impaired response to either a skin or blood test, travelers should inform their clinicians about such conditions. The risk of TB transmission on an airplane does not appear to be higher than in any other enclosed space. To prevent TB transmission, people who have infectious TB (TB that can be transmitted to other people) should not travel by commercial airplanes or other commercial conveyances. Only TB of the lung is infectious, and health department authorities determine whether a person is infectious based on the person’s chest radiograph, sputum tests, symptoms, and treatment received. The World Health Organization (WHO) has issued guidelines for notifying passengers who might have been exposed to TB aboard airplanes. Passengers concerned about possible exposure to TB should see their primary health care provider or visit their local health department clinic for evaluation. Bovine TB (M. bovis) is a risk in travelers who consume unpasteurized dairy products in countries where M. bovis in cattle is common. Mexico is a common place of infection for US travelers. TB disease can affect any organ but most commonly occurs in the lungs (70%–80%). Common TB symptoms include prolonged cough, fever, decreased appetite, weight loss, night sweats, and coughing up blood (hemoptysis). The most common sites for TB outside the lungs are the lymph nodes, pleura, bones and joints, brain and spinal cord lining (meningitis), kidneys, bladder, and genitalia. Infection is manifested by a positive TST or IGRA result 8–10 weeks after exposure. Overall, only 5%–10% of otherwise healthy people have an infection that progresses to disease during their lifetime. Progression to disease can occur weeks to decades after initial infection. People with TB disease have symptoms or other manifestations of illness such as an abnormal chest radio-graph. In the remainder, the infection remains in a latent state (latent TB infection or LTBI) in which the infected person has no symptoms and cannot spread TB to others. The risk of progression is much higher in immunosuppressed people (8%–10% per year in HIV-infected people not receiving antiretroviral therapy). People who are receiving tumor necrosis factor inhibitors to treat rheumatoid arthritis and other chronic inflammatory conditions are also at increased risk for disease progression. Diagnosis of TB disease is confirmed by culturing M. tuberculosis from sputum or other respiratory specimens for pulmonary TB and from other affected body tissues or fluids for extrapulmonary TB. On average, it takes about 2 weeks to culture and identify M. tuberculosis, even with rapid culture techniques. A preliminary diagnosis of TB can be made when acid-fast bacilli are seen by microscope on sputum smear or in other body tissues or fluids. However, microscopy cannot distinguish between M. tuberculosis and nontuberculous mycobacteria. This is particularly problematic in countries such as the United States where TB incidence is low. Nucleic acid amplification tests are more rapid than culture and specific for M. tuberculosis. They are also more sensitive than the acid-fast bacillus smear but less sensitive than culture. A diagnosis of TB disease can be made by using clinical criteria in the absence of microbiologic confirmation. However, laboratory testing should be performed when feasible to confirm the diagnosis. Molecular tests for drug resistance can be performed directly on specimens and can guide initial treatment while culture results are pending. Culture-based susceptibility testing is recommended for all patients with a positive culture, regardless of the availability of molecular testing, to make a final determination on the appropriate drug regimen. LTBI is diagnosed by a positive TST or IGRA after further examinations (such as chest radiograph, symptom review) have excluded TB disease. Tuberculosis is a nationally notifiable disease. People with LTBI can be treated to prevent progression to TB disease. American Thoracic Society (ATS)/CDC guidelines for treatment of LTBI recommend 9 months of isoniazid as the preferred treatment. The combination regimen of isoniazid and rifapentine given as 12 weekly doses using directly observed therapy is recommended as equivalent to 9 months of isoniazid for treating LTBI in otherwise healthy patients aged ≥12 years who are at higher risk of developing active TB, for example after recent exposure to contagious TB. For people who have been exposed to isoniazidresistant, rifampin-susceptible TB or who cannot tolerate isoniazid, 4 months of rifampin is a reasonable alternative. Travelers who suspect that they have been exposed to TB should inform their health care provider of the possible exposure and receive medical evaluation. CDC and ATS have published guidelines for targeted testing and treatment of LTBI. Because drug resistance is relatively common in some parts of the world, travelers who have TST or IGRA conversion associated with international travel should consult experts in infectious diseases or pulmonary medicine. TB disease is treated with a multiple-drug regimen administered by directly observed therapy for 6–9 months (usually isoniazid, rifampin, ethambutol, and pyrazinamide for 2 months, followed by isoniazid and rifampin for an additional 4 months) if the TB is not MDR TB. MDR TB treatment is more difficult, requiring 4–6 drugs for 18–24 months; it should be managed by an expert in MDR TB. ATS/CDC/Infectious Diseases Society of America have published guidelines on TB treatment (www.cdc.gov/mmwr/preview/mmwrhtml/rr5211a1.htm). 1 Disease data source: World Health Organization. Global Tuberculosis Report 2015 (WHO/HTM/TB/2015.22). 2015 (accessed June 23, 2016). Available from: http://apps.who.int/iris/bitstream/10665/191102/1/9789241565059_eng.pdf. Travelers should avoid exposure to TB patients in crowded and enclosed environments (such as health care facilities, correctional facilities, or homeless shelters). Travelers who will be working in hospitals or health care settings where TB patients are likely to be encountered should be advised to consult infection control or occupational health experts about procedures for obtaining personal respiratory protective devices (such as N-95 respirators), along with respirator selection and training. Based on WHO recommendations, bacillus Calmette-Guérin (BCG) vaccine is used once at birth in most developing countries to reduce the severe consequences of TB in infants and children. However, BCG vaccine has variable efficacy in preventing the adult forms of TB and interferes with testing for LTBI with the TST. Therefore, BCG is not routinely recommended for use in the United States. Recently, some experts have advocated BCG vaccination for health care providers who are likely to be exposed to MDR or XDR TB patients in settings where the TB infection control measures recommended in the United States are not fully implemented. BCG may offer some protection in this circumstance; however, people who receive BCG vaccination must follow all recommended TB infection control precautions to the extent possible. Additionally, IGRA is preferred over the TST for pre- and post-travel testing in people vaccinated with BCG. To prevent infections due to M. bovis, travelers should also avoid eating or drinking unpasteurized dairy products. American Thoracic Society and CDC. Diagnostic standards and classification of tuberculosis in adults and children. Am J Respir Crit Care Med. 2000 Apr;161(4 Pt 1):1376–95. American Thoracic Society and CDC. Targeted tuberculin testing and treatment of latent tuberculosis infection. Am J Respir Crit Care Med. 2000 Apr;161(4 Pt 2):S221–47. CDC. Availability of an assay for detecting Mycobacterium tuberculosis, including rifampinresistant strains, and considerations for its use—United States, 2013. MMWR Morb Mortal Wkly Rep. 2013 Oct 18;62(41):821–7. CDC. Recommendations for use of an isoniazidrifapentine regimen with direct observation to treat latent Mycobacterium tuberculosis infection. MMWR Morb Mortal Wkly Rep. 2011 Dec 9;60(48):1650–3. CDC. Treatment of tuberculosis. MMWR Recomm Rep. 2003 Jun 20;52(RR-11):1–77. CDC. Updated guidelines for using interferon gamma release assays to detect Mycobacterium tuberculosis infection, United States. MMWR Recomm Rep. 2010. Jensen PA, Lambert LA, Iademarco MF, Ridzon R. Guidelines for preventing the transmission of Mycobacterium tuberculosis in health-care settings, 2005. MMWR Recomm Rep. 2005 Dec 30;54(RR-17):1–141. Seaworth BJ, Armitige LY, Aronson NE, Hoft DF, Fleenor ME, Gardner AF, et al. Multidrugresistant tuberculosis. Recommendations for reducing risk during travel for healthcare and humanitarian work. Ann Am Thorac Soc. 2014 Mar;11(3):286–95. World Health Organization. Global tuberculosis report 2015. 20th ed. Geneva: World Health Organization; 2015 [cited 2016 Sep. 26]. Available from: http://www.who.int/tb/publications/global_report/en/. World Health Organization. Tuberculosis and air travel: guidelines for prevention and control. 3rd ed. Geneva: World Health Organization; 2008 [cited 2016 Sep. 26]. Available from: http://www.who.int/tb/publications/tb-airtravel-guidance/en/.